Mark your calendars for Saturday, August 2nd 2014! The inaugural ECS FC Footgolf Open Tournament is open to everyone of all ages so bring your family and your friends. This is an event you really don't want to miss. Following the FootGolf tournament, join us at the clubhouse for a viewing of the Sounders at Earthquakes at 7:30 pm. We will be sure to finish all the rounds before then so no one has to miss the match. The clubhouse has made a special arrangements for the viewing there so please return and join us! They usually have jazz night there every Saturday, but are moving that to Friday just for this event. There will be sound for the match. The cost for this tournament is $30. We have 2 seperate divisions: friendly & competitive. All profits from this event will go to ECS FC to use on practice gear, extra jerseys, field rentals, and other programs such as the annual match versus Portland. You must arrive by 4:15 to check-in to your space will be sold on a first come, first serve basis to those on standby. DON'T BE LATE!!! ECS FC is excited to announce the Beer for a Year contest, set to take place on Sunday, October 19th 2014 in conjunction with the Sounders @ Galaxy away viewing at The Atlantic Crossing. Grand prize is beer for a year from Redhook brewing - two cases per month for 12 months! Although entering the contest is free (one entry per individual), there is a strongly recommended $10 minimum donation per entry. Help support the supporters! $5.50 Jameson special will be available from 3 PM onward, $5 for card-carrying ECS members! Don't forget to ask for Redhook No Equal when choosing your beer - each pint of No Equal purchased after 3 PM will earn $1 for ECS FC! Entries will be accepted starting at 3:00 p.m. 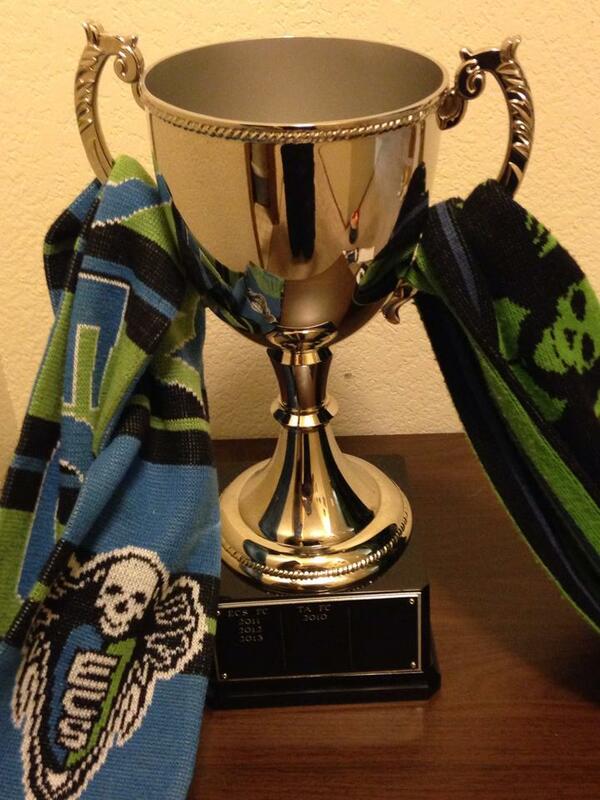 The winners will be drawn at halftime of the Sounders @ LA game. Come and show your support for the club and for delicious, vast amounts of beer. Emerald City Supporters FC are happy to announce that their annual series of supporters' matches against Timbers Army FC are set to take place in Portland on the weekend of August 23rd, 2014, which is the day before the Sounders take on the Timbers at Providence Park. Timbers Army FC will host the 2014 event at Buckman Field in Portland. The men’s second teams and women’s teams will play concurrently on the two fields at 4:00 PM, and the men’s first teams will play in a standalone match at 6:00 PM. Since 2010, the recreational amateur sporting clubs of these two supporters groups have faced off in annual games coinciding with a Sounders vs Timbers match on the same weekend and rotating between host cities each year. What began as a single match between the two groups in March of 2010 has grown to include men’s second team matches starting in 2012 and now will also include a women’s match, new for the 2014 edition. Though the teams are composed solely of recreational soccer players, both supporters groups view these matches with utmost importance as they are playing not only for the pride of their home cities but also for the honor of their fellow supporters. Underlining this importance, the winner of the men’s first team match will hoist the champions’ trophy which was introduced in 2013. ECS FC has not lost a match to Timbers Army FC since 2010, going 4-1-1 in the entire series. In the 2013 matches hosted in Seattle, the first and second ECS FC teams beat TAFC by the combined score of 11-1, and the results were triumphantly displayed at CenturyLink Field before the MLS match the next day. ECS FC would like to extend an invitation to all Sounders who wish to come down early for the weekend to support Seattle soccer in the lead-in to the Cascadia Cup match. In 2012, we had a sizable and boisterous contingent of ECS FC fans who outnumbered Timbers Army fans in their own backyard, and whose support rallied the teams made the matches extremely special for our players. We are expecting even stronger traveling support in 2014.